Current Client - What's your question? What is my email username/password? Your username is your email address. For example, info@cmconcepts.biz is the username for info@cmconcept.biz. If CMC set up your password, please contact us for your password. How do I set up my email account on my computer? 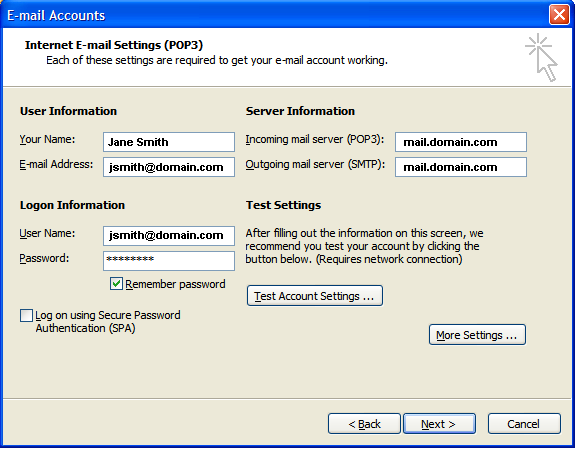 When we create e-mail accounts for your new domain, you will need to set them up in your mail program. Click any link below and follow the instructions. 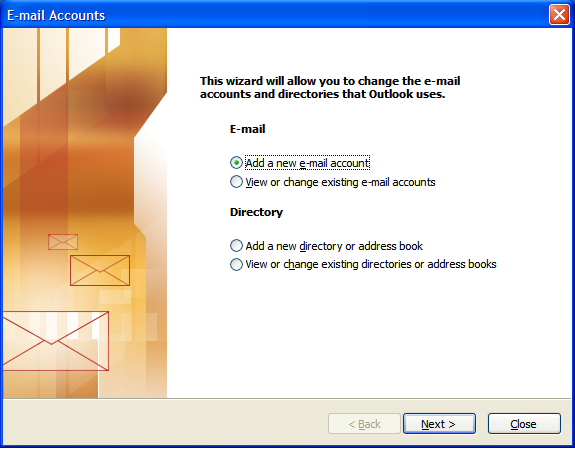 This tutorial shows you how to set up Microsoft Outlook to work with your e-mail account. 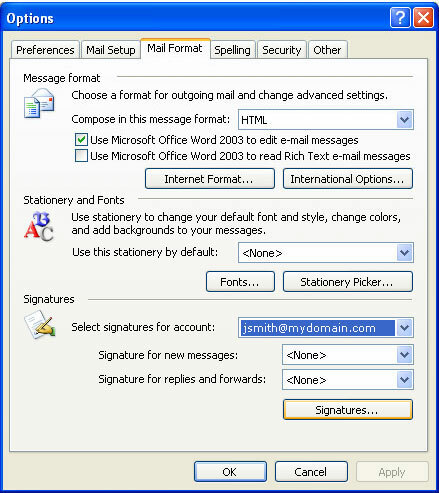 This tutorial focuses on setting up Microsoft Outlook 2003, but these settings are similar in other versions of Microsoft Outlook. 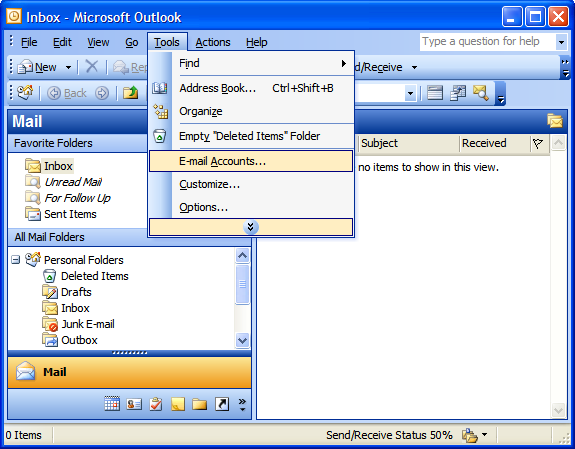 You can set up previous or later versions of Microsoft Outlook by using the settings in this tutorial. On the Internet E-mail Settings window, select the Outgoing Server tab. NOTE: As a courtesy for our clients and friends, we provide information about how to set up your email accounts on certain third-party software, but we do not endorse or directly support these third-party products and we are not responsible for the functions or reliability of such products. Outlook™ is a trademark of the Microsoft Corporation in the United States and/or other countries. All rights reserved. 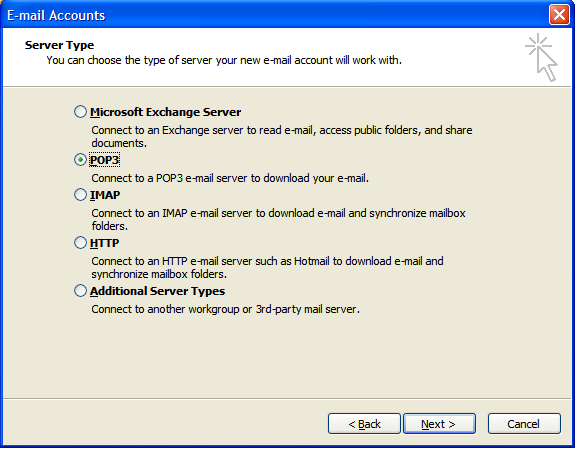 This tutorial shows you how to set up Microsoft Outlook Express 6 to work with your e-mail account. 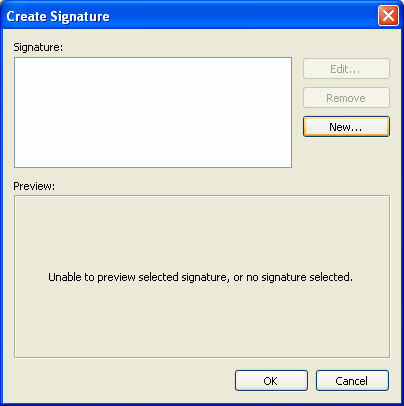 These settings are similar in other versions of Microsoft Outlook Express. 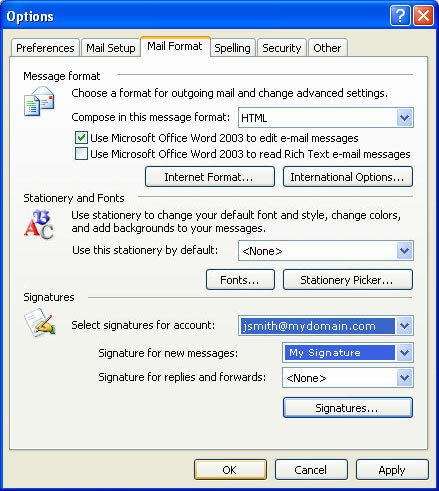 You can set up previous or later versions of Microsoft Outlook Express by using the settings in this tutorial. Do Not Check the box for Log on using Secure Password Authentication. On the setup confirmaiton page, click Finish. On the Mail tab, select the account you just created and then click Properties. Select My server requires authentication, and then click OK. NOTE: As a courtesy for our clients and friends, we provide information about how to set up your email accounts on certain third-party software, but we do not endorse or directly support these third-party products and we are not responsible for the functions or reliability of such products. Outlook Express™ is a trademark of the Microsoft Corporation in the United States and/or other countries. All rights reserved. This tutorial shows you how to set up Mozilla Thunderbird™ to work with your e-mail account. While the appearance may slightly differ depending on which version you have, these settings are the same in older and newer versions of Thunderbird. Select POP as the type of incoming server you are using. Your incoming server is mail.yourdomain.com. Click Next. 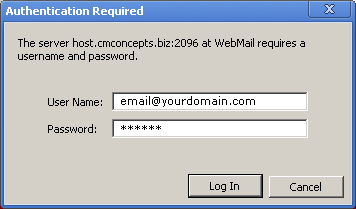 Enter mail.yourdomain.com (replace "yourdomain.com" with your actual domain address) address for both the Incoming User Name, and Outgoing User Name. Click Next. NOTE: As a courtesy for our clients and friends, we provide information about how to set up your email accounts on certain third-party software, but we do not endorse or directly support these third-party products and we are not responsible for the functions or reliability of such products. Thunderbird™ is a trademark of the Mozilla Foundation in the United States and/or other countries. All rights reserved. Select the Accounts tab, and click the plus sign(+) at the bottom of the Accounts box. 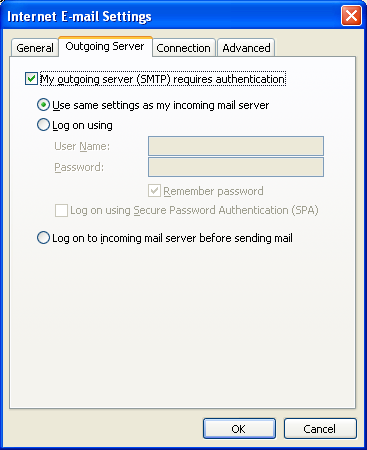 When the SMTP Server Options window displays, type mail.yourdomain.com in the Outgoing Mail Server field and change the Server Port setting to 80. Under the Authentication list, select Password and enter your SMTP user name (full email address) and password. NOTE: As a courtesy for our clients and friends, we provide information about how to set up your email accounts on certain third-party software, but we do not endorse or directly support these third-party products and we are not responsible for the functions or reliability of such products. Apple Mail is a trademark of Apple® in the United States and/or other countries. All rights reserved. How do I add an email signature or banner to all of my outgoing emails? 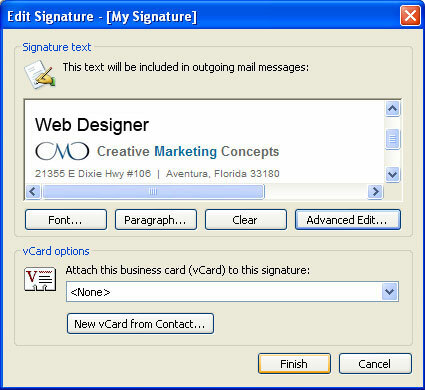 You can add a custom html signature file or jpg banner to your outgoing emails so that whenever you write an email, it automatically appears at the top or bottom of your email. Click the link below for instructions. This tutorial shows you how to set up an .html document as your signature at the bottom of your e-mails in Microsoft Outlook. 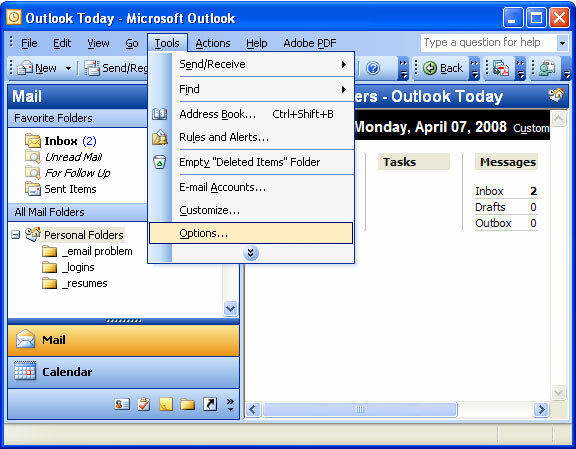 While this tutorial focuses on Microsoft Outlook 2003 these are similar in other email programs (older and newer). 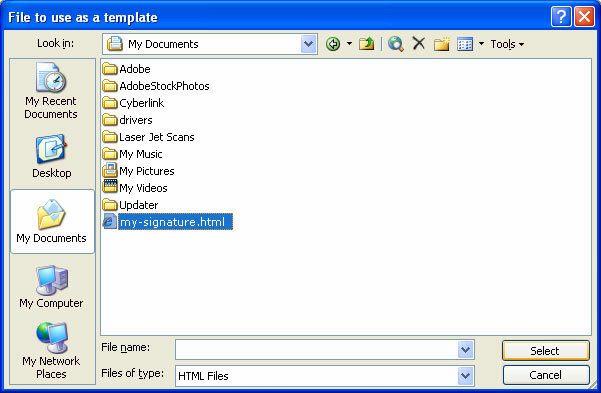 First, save the .html file that we emailed you onto your computer in "My Documents" or on your Desktop. 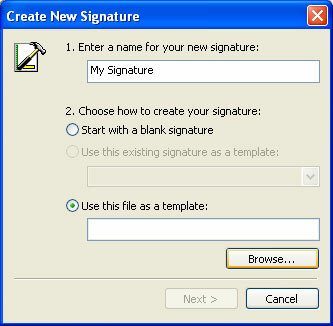 Enter a name for your signature such as "My Signature" or "Amy - CMC Signature"
Now make sure you have your signature set up for "New messages." Then click OK.
You're all set up. Try to e-mail someone and make sure it works! How do I access my email through the internet? It's easy! You can check your email on any computer through any internet connection. Have your email address and password ready and click the link below. 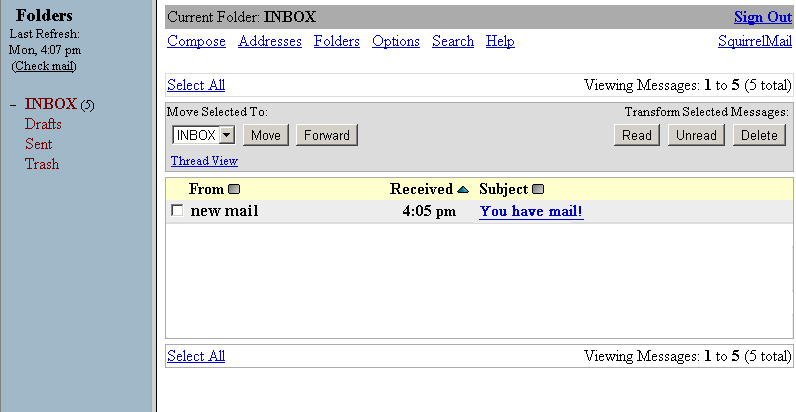 You will then be able to choose which mail program you would like to use. 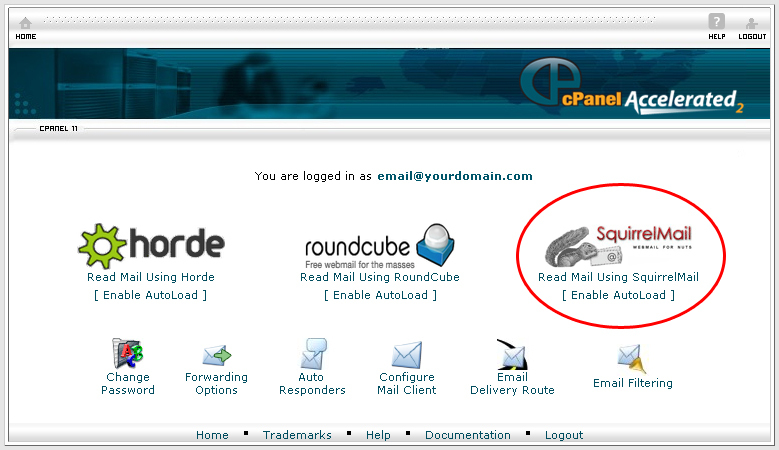 We recommend clicking SquirrelMail as it is the easiest to learn. But feel free to experiment with any of them. You may also click the Enable AutoLoad link underneath your choice to allow it to automatically open next time you check your mail. Established in 1999, Creative Marketing Concepts, Inc. is home for a team of professional, creative and out-of-the-box thinkers. With countless years of combined experience, the CMC team works in synergy to create compelling marketing strategies and solid brands for its clients.